As I write this, I look ridiculous. If you could see me right now, you would laugh out loud. It is 6:00 am, and I am wearing my wife’s blue terrycloth bathrobe (it’s cold in here, and it was the closest thing available). My hair is a mess, and I haven’t shaved. And here I am, writing a column on leadership. Business icon Jack Welch has written extensively on something he calls “authentic leadership.” Real leaders, he says, should be real. (Also, they should be leaders.) As I’ve thought about this advice over the years, I think that what Welch means is that the best leaders are human. Let me paint a picture of a high-earning boss that went to a top business school. He has formidable math skills. His hair is styled perfectly. He wears $500 shoes. Everybody is terrified to approach him. Here’s another boss who is also a consummate professional, but listens when you have a problem. She talks frequently of her family. Occasionally she’ll take you out to lunch. There’s a human connection. Which boss inspires you to do your best work? When people are learning leadership skills, they often don’t know how they’re supposed to “act.” What many managers do is create an autonomous robot that they bring to work. You know these humorless, unfeeling cyborgs; maybe you’ve worked for one. They periodically need oiling, lest their joints rust. You can’t imagine having a beer with them, because they run on hydraulic fluid. Contrast this with the boss who is human, who is vulnerable. We crave to hear from our leaders: What challenges have you faced, and how did you get through them? Where do you still struggle? Do you have a life outside these cubicles? What’s it like? What gets you excited? What ridiculous thing happened to you recently that shows your humanity? Being vulnerable does not mean sharing everything (we don’t need to hear about your hemorrhoids). Sometimes you’ve got to be tough: delivering bad news, dealing with difficult people, firing someone. And of course, some people will take advantage of vulnerability; in highly political, toxic companies, it may be best to wear a carbon fiber exoskeleton (and look for a new job). We set the tone: We build environments where people are able to experiment, learn, and explore. It becomes safe to make mistakes, to learn from failure, to laugh at ourselves. We teach life skills: We show our teams not only how to be a manager, but a man. We show them not just how to be a womanager (I made that up), but also a woman. Good leaders inspire people to run good lives. We build trust: Lee Scott, the former CEO of Walmart, says authenticity leads to trust. If you’ve ever been on a high-performing team where everyone trusts each other, it’s like a kind of magic. This simple principle of being human flows into every part of your company. At Media Shower, for example, we see many businesses afraid of being human in their content marketing, which is why most corporate blogs are safe and bland, like unflavored pudding. Most companies don’t want to make waves with their customers, or appear “unprofessional,” so they produce content that no one reads. When we teach them to open up, to show something of a personality, their customers can feel it. They respond. 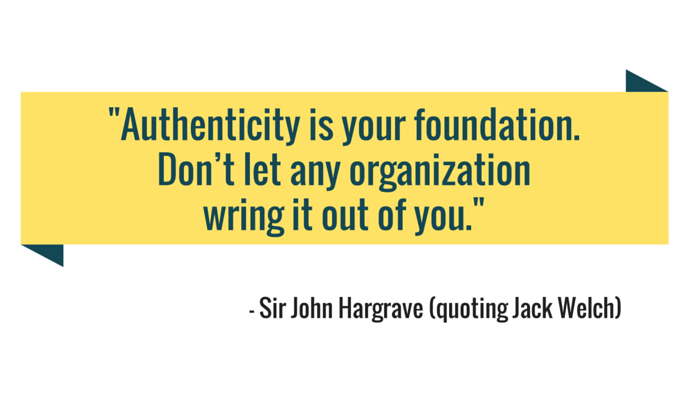 It is scary to be vulnerable (maybe that’s why Jack Welch uses the word “authentic” instead). We are afraid to open up, to show ourselves. After all, we could be rejected, ridiculed. We could look foolish. Who looks forward to taking off their clothes at the beach? I opened this post by telling you that I’m wearing a woman’s bathrobe. It’s a small thing, opening the window of my soul just a crack (fortunately, only my soul, not the bathrobe). But that small admission of “being human” got you reading, and here you are at the end. People respond to vulnerability. Sir John Hargrave is the CEO of Media Shower and author of Mind Hacking, the how-to manual for hacking your head, available in 2016 from Simon & Schuster’s Gallery Books. This post is free to distribute under Creative Commons 4.0: if you like it, share it.